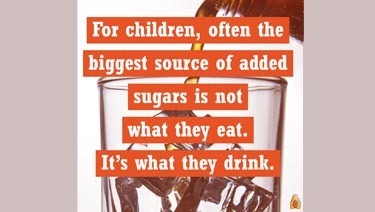 On average, sugar makes up 17% of what children consume each day. That's a lot of sugar―and half of that comes from drinks with added sugar! Many foods or beverages have extra sugar and syrups added to them when they are processed or prepared. These added sugars have many different names, such as brown sugar, corn sweetener, corn syrup, dextrose, fructose, glucose, high-fructose corn syrup, honey, lactose, malt syrup, maltose, molasses, raw sugar, and sucrose. In a joint policy statement, the American Academy of Pediatrics and the American Heart Association explain the health consequences of this added sugar problem and what can be done to reduce kids' consumption of sugary drinks. Read nutrition facts labels carefully. Many foods now list added sugar separately. You also can find added sugar by reading the ingredients. Aim for less than 25 grams (about 6 teaspoons) of added sugar per day for children 2 years of age and older. Avoid serving foods and drinks with added sugar to children under 2 years of age. Learn more about nutrition facts labels here. Serve water and milk. Avoid soda, sports drinks, sweet tea, sweetened coffee, and fruit drinks. Milk contains natural sugar (lactose) and provides calcium, protein, vitamin D, and other nutrients children need. Limit fruit juice. It has more sugar per serving than whole fruit. The AAP recommends no more than 4 ounces of 100% fruit juice a day for children ages 1 through 3 years; 4 to 6 ounces for children ages 4 through 6; and 8 ounces for children ages 7 through 14. Do not give fruit juice to infants under 1 year old. Go fresh and limit processed, pre-packed food and drinks. Sugar is often added to them while they are being made or at the table. For example, there are hidden sources of added sugar in processed foods like ketchup, dried cranberries, salad dressing, and baked beans. Satisfy your child's sweet tooth with whole fruit. Beverage companies spend millions in marketing to adults and children―$866 million in 2013―with most teens seeing at least one ad for a sugary drink every day, according to the Rudd Center for Food Policy and Obesity. Kids from minority and low-income communities are at a greater risk due to the low-cost, easy access to sugary beverages. Learn more about food marketing and media use and food marketing in schools here. Kids who drink more than 10% of their daily calories from added sugars are more likely to have abnormal cholesterol levels, including higher "bad" LDL cholesterol, higher triglycerides, and lower heart-protective HDL cholesterol. They are also at an increased risk of developing type 2 diabetes.